The President of the General Assembly, Mr. Mogens Lykketoft kicked off his his visit to Brussels 16-18 February with a breakfast meeting with journalists at the premises of UNRIC, The UN Regional Information Centre. 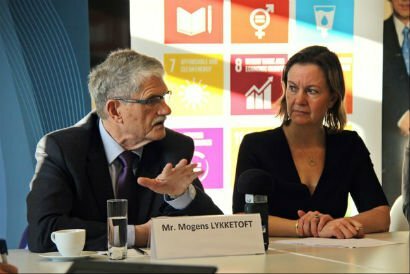 President Lykketoft had a lively discussion on such issues as the Sustainable Development Goals (SDGs), the refugee crisis, Official Developmen Aid and the election of the next Secretary General. Today and tomorrow, Mr Lykketoft will meet senior European Commission officials, including Commission President Jean-Claude Juncker, as well as the Belgian Foreign Minister and Deputy-Prime Minister, Mr. Didier Reynders. Among the topics on the agenda of Mr. Lykketoft´s visit are the implementation of the Sustainable Development Goals and the Climate Agreement, efforts to enhance the role and effectiveness of the United Nations in matters of peace and security, the global refugee crisis and the integration of human rights into all United Nations engagement.